In an Olympic year, naturally many of the highlights came from London. But there were many more great stories throughout the season. Here is a selection of the top hammer throwing stories from the 2012 season, both good and bad. As I noted in my Olympic recap, three women broke 77 meters for the first time ever at the same competition, four women (and eight throws) were at or over the Olympic record, five women broke 76 meters, and it took 74 meters just to place in the top eight and get to take the final three throws. According to the indispensable stats website Tilastopaja, the London Olympics featured the best marks ever for second through eleventh place. In other words, never has someone ever thrown so far yet placed so low. Before London a throw of 75 meters had never been left off the podium at any level. 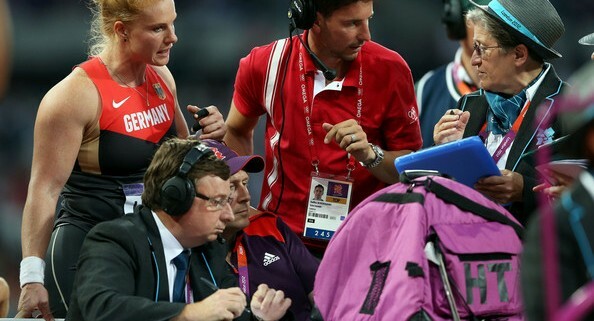 In London, two throwers with marks of 76 meters were left off the podium. The only thing that was missing was a world record, and even that was not that far off. With so many women currently at such a high level the 80 meter barrier must finally be close to falling after more than a decade of anticipation. The hammer throw Olympic trials had a new format this year. Rather than being held as part of the regular event, it was renamed “Hammer Time” and held a day early and two hours north at the Nike World Headquarters. I was skeptical about the special format, but everyone put that aside on June 21st as 48 men and women stepped showed up in front of thousands of fans to battle for a chance to make the US Olympic team. Kibwe Johnson and Amber Campbell won, it was a few other athletes that made the day even more memorable. Underdog Amanda Bingson held the lead for much of the competition, but entering the finals she still didn’t have the Olympic qualifying standard. On her fourth attempt she finally reached it. Chris Cralle was even more of an underdog in the men’s competition and managed to place second. While he fell short of the qualifying standard, his working-class attitude was a favorite among the press and gave him 20 minutes of fame. Popular runnning website ran a large headline about the event and a video interview with men’s runner-up Chris Cralle, their first ever with a hammer thrower. Stories like these made the meet as memorable to me as some of the bigger meets with further throws throughout the season. On paper, Krisztian Pars should have been the clear favorite for gold in London. However he had been in that role at the past few major championships and never come through before. After claiming several major titles as a junior, Pars had never won Olympic or World Championship gold. But this year he was so dominant nothing could keep him from winning not only the Olympics, but also his first European Championship and 15 or 16 finals throughout the season. I easily ranked him first this year. Track and Field News found his season so dominant that their panel of experts ranked him among the top ten track and field athletes in the world this year, the first time a male hammer thrower has received that honor in many years. Heidler had a few words for the officials after the competition. Meet officials have a tough job. When they perform well they receive little praise, but when they make the slightest error everyone complains. In London there were many complaints, although it was because there were some big errors in the form of a delayed men’s competition and multiple measuring errors in the women’s competition. The most high profile mistake affected world record holder Betty Heidler. Her fifth-round throw clearly moved her onto the podium, but instead the final results put her in fifth place. After Zhang Wenxiu ran a victory lap thinking she won a medal, officials finally corrected the mistake and awarded Heidler the bronze. Instead of happiness of everyone, the final ended in tears, confusion and anger. You can read more about the officiating problems in my post from earlier this year. It seems every four years hammer throw gets pulled down in its own dirt. In 2004, gold medalist Adrian Annus was disqualified for doping. In 2008, medalists Ivan Tikhon and Vadim Devyatovski were disqualified before a successful appeal returned their medals to them. This year none of the medalists were hurt by doping allegations, but instead the headlines were filled with more news those prior years. As the doping tests have gotten better, retested samples from the 2004 Olympics snagged Ivan Tikhon on the eve of the Olympics. Tikhon had just returned to competition after the 2008 fiasco and produced a world-leading mark during the summer. But the day before Olympic competition started he pulled out as rumors of the 2004 positive test came through. It was finally confirmed in November and the International Olympic Committee stripped his 2004 medal in December. A few weeks later it was revealed that a retest might also take away former world record holder Olga Kuzenkova’s 2005 world championship title. While you might think that since the big stories all related to prior years, doping is a thing of the past. But several current athletes were also caught this year. Marina Marghieva, who was expected to join her sister as an Olympic finalist, was banned just days before the Olympics. During the off season, Kirill Ikonnikov also tested positive. Ikonnikov was fifth in London. Even the women’s champion has previously served a doping ban. This is a sign of progress, but also a sign that doping still very much exists. 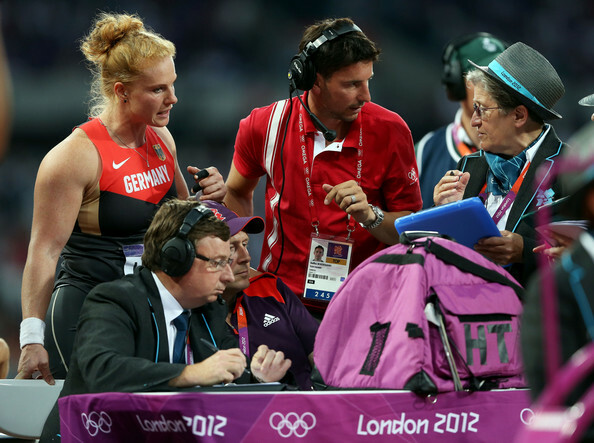 The German athletics federation threw its support behind Kathrin Klaas’ push to have the hammer throw included in the Diamond League. While the Diamond League will still be without the hammer throw in 2013, this is a small and needed sign of progress on this front. After a strong 2011 season, twenty-three year old Pawel Fadjek of Poland continued to improve this season with several 80 meter throws. As the only person to defeat Pars in 2012, he has to be taken as the best of the next generation of hammer throwers and a name that we will see a lot of over the next decade. With throwers like Koji Murofushi and Szymon Ziolkowski showing their age, a changing of the guard is near. By placing three athletes in the Olympic final, English-speaking countries had a showing that had not been so strong in decades. Kibwe Johnson(US), Alex Smith (UK), and Sophie Hitchon (UK) all qualified for the final in London as underdogs. As a young hometown favorite, Hitchon especially brought many new fans to the event and all three will play a big role in the coming years. While the North American women did not finish as high in London, they still had quite the season. Jessica Cosby broke the American record with a throw of 74.19 meters (243-05) at the Prefontaine Classic. Earlier in the season my friend Sultana Frizell broke both the Canadian and North American records with an even more impressive throw of 75.04 meters. As with last year, I have to include myself on this list. While I did not throw as far as I wanted this year, I claimed the Swiss title for the fourth straight year. Whether you celebrated it or not, it was one of my favorites moments of the year. Happy new year. The hammer throw is such a spectacular event and you really deserve great appreciation for your efforts at drawing people’s attention to it. Ashraf Elseify winning the world juniors with a new world junior record of 85,57m is surely the top story of the year???? And another 2 years as a junior – he is the greatest prospect in world hammer throwing there has ever been.